Em's classroom is having a Halloween party next week, and of course we were told to bring a treat or toy to share with the class. I have enough anxiety worrying about whether or not I'm poisoning a typical child with some sort of food allergy or aversion, so a classroom with 9 special needs kids? I wasn't taking any chances. We went the toy route for sure. 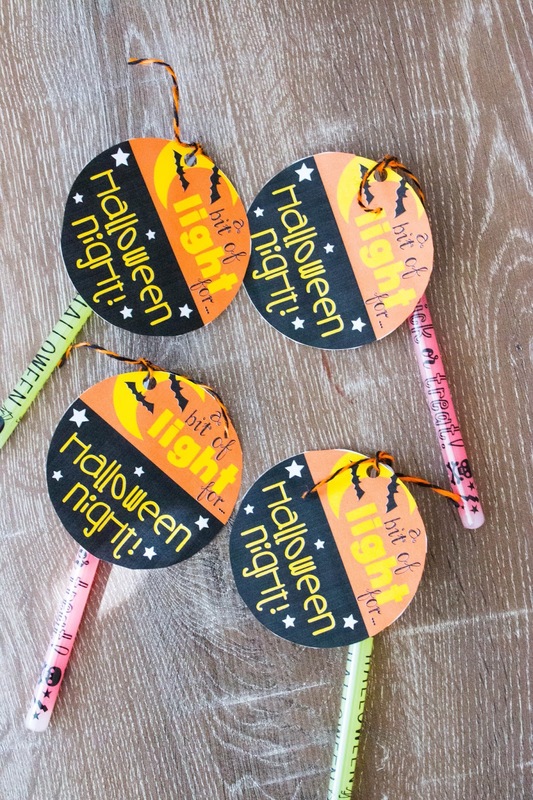 I was at Target today with the kids after school and found these three packs of glow sticks there for $1 and figured I could find a little printable on Pinterest to go with them, and then tie it on with some bakers twine, and call it good. 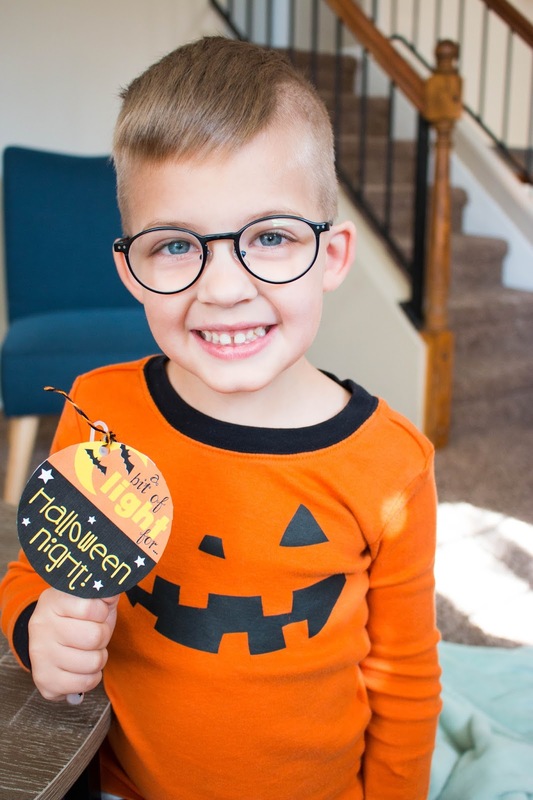 When browsing pinterest I found Lady bug Teacher Files blog, and her super cute Halloween printable. 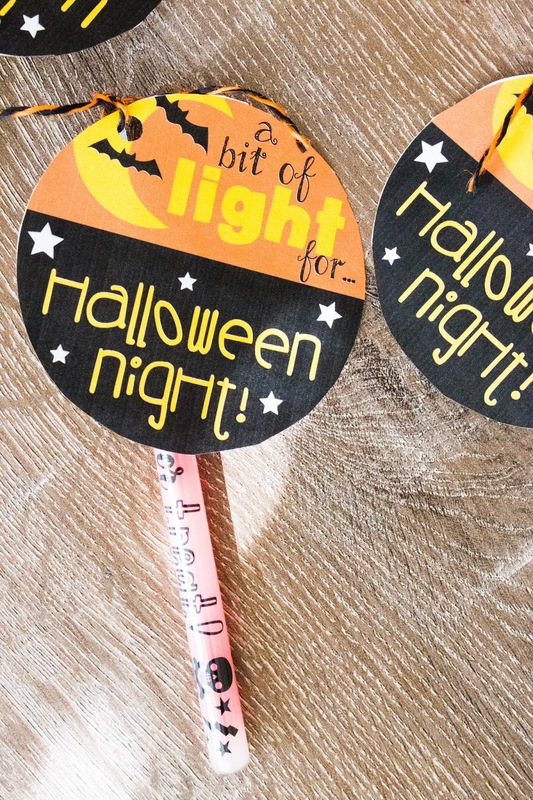 It says, "A bit of light, for Halloween night!" Super cute and simple. The hardest part about this craft was waiting for the paper to come out of my deathly slow printer. And it was fun to have my little helper with me to cut out circles, and of course help with photographing the end results! What fun gifts are you making for Halloween this year? I love this idea! So smart to do something that will be fun for the kids, keep them visible and safe, and not have to worry about food allergies!! Oh the kiddos are going to love those. What a great idea! This is a good idea for the kids and easy to implement. Guess I will try something along these lines for next years halloween !!! 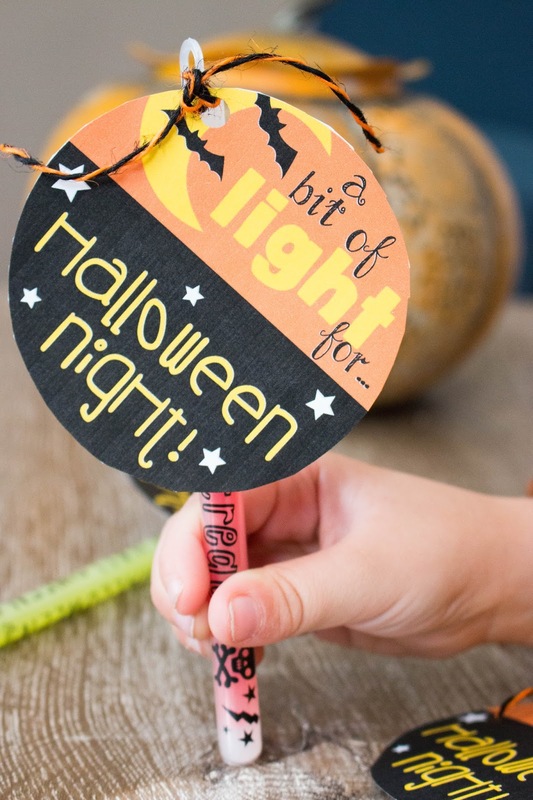 Such a nice idea, my kids love glow sticks and a little fun glow stick will be well loved too. It is better to have these kind of fun game ideas than cooking something that might have some allergy ingredients. This is such a great Halloween gifts idea for the kids. and I'm sure that kids will love this glow stick. What an awesome idea for Halloween, i think the kids would be creative if they have this on Halloween :). Your son is so proud of his Halloween gift, soo adorable! :D I have no plans for Halloween. VERY cute idea! I so love that you did something cute like this rather than candy. These glow sticks are such a fun idea for kids! Hope you and your family have a great Halloween. This is such a fun idea for Halloween! It is way better than candies! Have a great Halloween with your family! Yesss! A Diferent halloween post from others blogs! SMART DIY gift! thank you for sharing i will do it for my little sister too! have a nice halloween weekend! This week my blog has a halloween post! Check my scary post at the blog if you have some free time! How cute! I love simple Halloween ideas like this. Glow sticks are great for Trick or Treating night. This is such an awesome idea,I am sure the kids would love it.I love the shirt your son has on too, he looks super cute. Super cool idea, especially for when you aren't wanting to just send more candy to everything already candied out for Halloween. Love this alternative idea! What a fun idea! I know the kids are going to enjoy those. Very different than the typical candy bag! These are a cute idea! I am sure my kids will love this glow sticks. Thanks for sharing. I didn't do halloween this year. everyone was too busy. so nothing super exciting on my end. These sticks look rather nice!